The month of April has been full of poetry at the House of Hope, thanks to my commitment to participate in Poetry Friday and the Kids’ Poetry Challenge. We have also just this month begun visiting another local library, in addition to the couple in neighboring towns that we usually frequent. I’ve found several poetry books on the new shelf at this library, so this has made the challenge even more enjoyable for me. When I saw this bright yellow volume, I picked it up immediately and added it to our stack. Who could possibly resist this cover, I ask you? Even if you didn’t know that this book is chock-full of the rollicking verse of Edward Lear, nonesense writer extraordinaire, could you pass up this whimsical cover? The prolific Daniel Pinkwater is listed as the “mastermind” behind this volume; Calef Brown is the illustrator who captures the spirit of Lear’s poetry so perfectly. What’s more fun than a toeless, imaginary creature with an aunt named Jobiska? Oh, yes, a toeless, made-up creature that “tinkedly-binkedly-winkled a bell”! O! My aged Uncle Arly! The accompanying illustration is of a rather dapper Uncle Arly, staring into the eyes of the huge, green cricket perched on his nose, and with a train ticket tucked into his hatband. Funny stuff! Who always had something to say. And then she was carried away. I think Lear, the inventor of the word runcible, would approve of Louise’s coining of the word tock, which means “somewhere in your head.” 🙂 Of course, I had the girls illustrate the limerick, too. Found Gatsby, and made use of his legs. 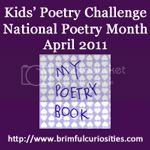 I’m linking this post up to both Poetry Friday, hosted this week by Tabatha Yeatts: The Opposite of Indifference, and the Kids’ Poetry Challenge at Brimful Curiosities. April is almost over and with it, National Poetry Month, but I have enjoyed this little exercise so much that I think I’ll try to participate in Poetry Friday as often as I can in the future! Oh — thanks for sharing! I can’t wait to get this book. Calef Brown is one of our family favorites. What a fun way to introduce Lear to children. That book looks amzaing. The rock/tock limerick and accompanying illustrations are hilarious — poor May! By the way, the link-up is now live. I didn’t get a chance to finish my post until this morning because my son suffered from a bout of croup last evening! “tock” is a wonderful word and just right for your limerick! I was also in a Lear frame of mind this morning — posted “The Quangle Wangle’s Hat” today. Poetry I have a hard time with – but I’ve always thought limericks were fun! Oh dear! Lear definitely sounds like someone worth reading. Those few stanzas you shared had me smiling ear to ear! I think the Poetry for Young People series has a volume on Edward Lear too – I wonder how much the selections would overlap. The illustrations definitely help make it attractive and accessible to the young ones though. Thanks for linking up at Feed Me Books Friday!